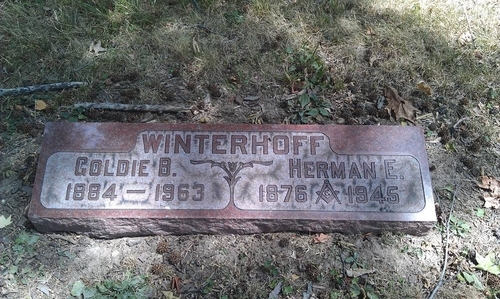 It's time to pay credit to the man who invented the vibraphone, the well tempered marimba bar, and the musical element, Herman E Winterhoff of Indianapolis. Never mind, he will appear alive below the fold. During the 19th century musical instrument making became a mass-production, factory-based business. The little ateliers of luthiers of all kinds continued to thrive -- or at least to get by somehow -- but the 1860s, when Steinway in New York went from producing 500 pianos a year to producing 1800 pianos a year, can be regarded as a tipping point. For the first time, the musical instrument business offered the possibility of becoming rich, or at least becoming a captain of industry and achieving prominence, respect and very large debts. If you didn't want to compete with Steinway, you might find some other instrument with the potential of becoming as ubiquitous as the piano, perhaps an instrument not yet taken seriously by the musical toffs (the banjo? the saxophone?) -- perhaps an instrument not even invented yet. 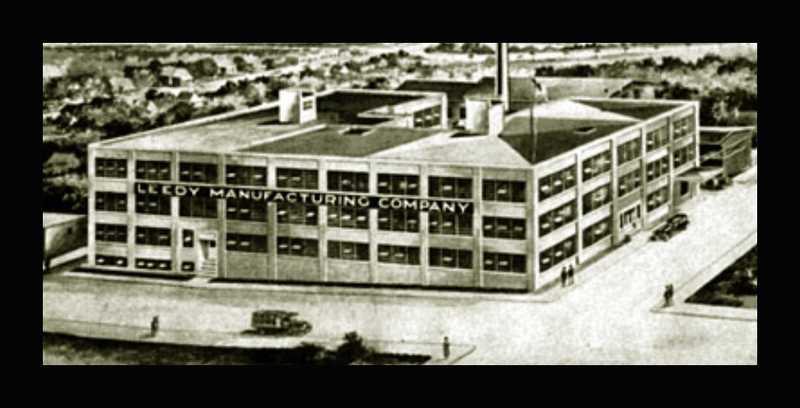 Item: C G Conn branched out from the grocery business with the slightly kookie idea of adding a rubber rim to a brass instrument mouthpiece (easier on the lips) and in ten years became the busiest employer in Elkhart, Indiana, and the biggest band instrument manufacturer in the world. His smart boys included Gus Buescher (who persuaded Conn to start making saxophones, the first to do so in the US, and then left to set up on his own). Item: John Calhoun Deagan started in 1880 as a one-man operation offering a better-tuned glockenspiel, expanded into xylos, marimbas, enormous carillon installations and (would you have guessed?) 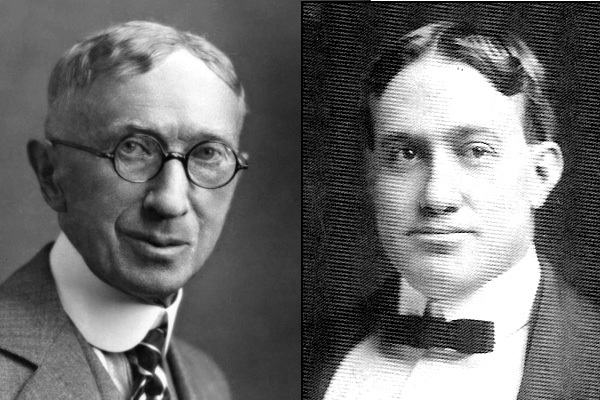 dinner chimes; his Chicago factory (opened 1912) was advertised as the -- um -- largest musical factory in the world; his smart boy was Henry Schluter, who supposedly joined at the bottom rung and became head tuner and all-round boffin. 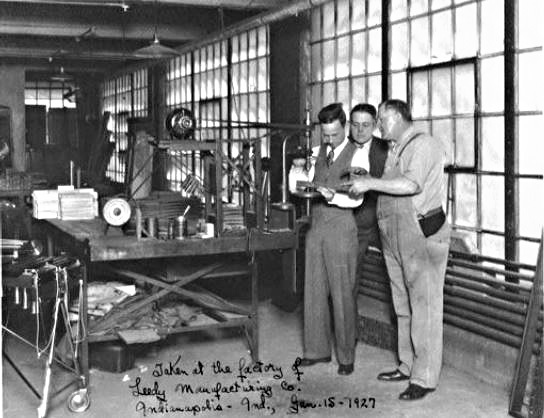 Item: Ulysses G Leedy invented a folding snare drum stand and started making them in his apartment in 1898, and by 1920 his Indianapolis factory was (naturally) the largest manufactory of percussion instruments in the world. He had at least a trio of smart boys; George Way (general manager), Cecil Strupe (chief engineer), and Herman Winterhoff (workshop maven). 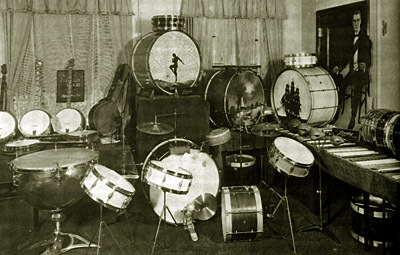 So, the early 20th century saw two big beasts in the percussion world. 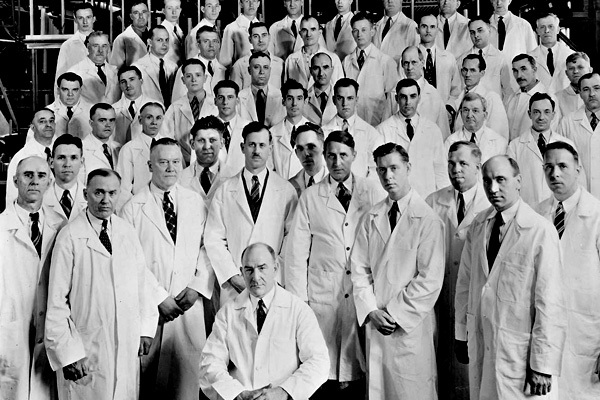 ... and although this looks like Judgement Day at the pharmacists' convention, it is a smart attempt by the Deagan PR people to project the company as a gleaming world-of-science-staffed-by-furrowed-brow-eggheads. Leedy falls behind here, at least iconographically, All the internet can provide is some rather gloomy pics of drums and tuned percussion gamely pushed together into a "display". NB I will credit picture sources at the bottom of the post. Of course if you have a factory (the largest in the world, even) and a sizeable number of employees, you need to keep on selling a LOT of instruments. So your market has to stretch far beyond the needs of those pros who actually use your instruments to make a living. You have to appeal to the up-n-coming cohorts (students, schoolchildren) but also as widely as possible among the general public. This pressure leads to constant change and "innovation" in your standard products (I put "innovation" in quote marks because it also includes UN-ovation, i.e. stepping smartly backwards to the good old days and bringing out models that evoke the true old fashioned values that our competitors are failing to maintain blah blah blah). It also encourages the hunt for brand new products. Deagan had a particularly busy streak. 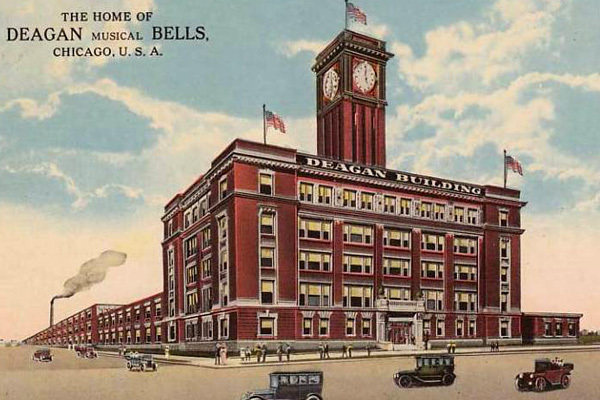 "[J C Deagan] developed many other musical instruments, including the xylophone, organ chimes, aluminum chimes, aluminum harp, Swiss handbells, and orchestra bells. The marimba he developed from a novelty from the jungle into an accepted musical instrument. He evolved the original marimbaphone with metal into the vibraharp, the drawn tubular cathedral chime for pipe organ and orchestra use, and the steel bar celeste and wood bar harp for pipe organ use..."
Without derogating from Deagan's personal talents we should probably see this as an example of credit accruing to the nearest prominent personality. Deagan founded the company, it bore his name, ergo he personally did all this stuff. In reality many other people were involved, some probably had greater involvement in the process than Deagan himself, and if the Deagan company hadn't done it, someone else would. As far as the vibraphone is concerned, someone else did. 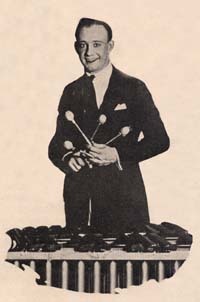 "Beginning about 1916, Herman Winterhoff of the Leedy Manufacturing Company in Indianapolis experimented off and on with a variety of motor-mechanical arrangements in his quest for a vox humana or tremolo effect from the bars of a three-octave F-F steel marimba, a novelty vaudeville instrument with thin, steel tone bars mounted to the keybed on tapered felt strips. He succeeded in 1922 by mounting a motor on the frame at the narrow end beneath the bars to drive dual shafts fitted with metal discs centered in the tops of each resonator tube. As the discs (pulsators) revolved in the resonator columns under sounding bars, a tonal phase shift was created resembling a vibrato." "Winterhoff ... produced a device called the Vibratone, which had two rows of resonators moving up and down alternately. This and another model, with butterfly fans in the tops of the resonators which rocked back and forth in a semicircle, were unsuccessful due to noise." " ... in the 1920's Winterhoff and the Leedy engineers devised a practical instrument with rotating fans in the resonators which made complete, even revolutions." It is not an easy thing to come up with the obvious solution, it seems. NB The Smithsonian also provides the name of at least one of the "Leedy engineers", Leroy Jeffries. 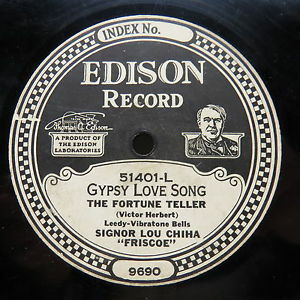 About 25 of these earliest vibraphones were sold, under the name of the "Leedy Vibratone bells" and they allegedly caused a minor sensation in the vaudeville world; Edison xylophonist Signor Lou Chiha ("Friscoe") recorded two sides Aloha Oe and Gypsy Love Song on the Vibratone Bells and if you get to hear them (at least one of them is somewhere on YouTube) be prepared for a special listening experience. The bars were steel and only the fundamental was tuned; the clashing overtones wobble along bravely giving an air of genial derangement. "The previous April [of 1927] the vibraharp had been introduced by J. C. Deagan, Inc., . . . 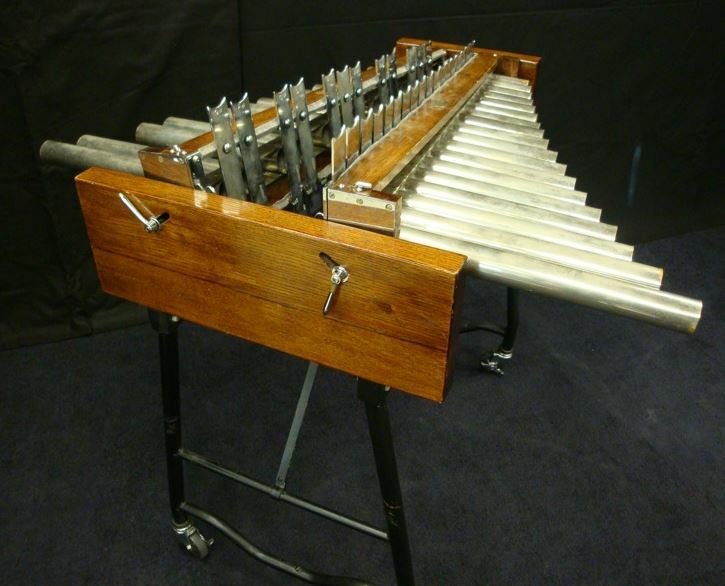 The Deagan vibraharp was developed by chief engineer Henry J Schluter, who conceived the design as an entirely new mallet instrument, not a modification of an existing design. He drew upon his experience with such earlier Deagan devices as aluminium-bar song bells and the large organ vibrato harp ..."
Er -- what? An entirely new mallet instrument? Not a modification of an existing design? Hmm, not credible. I don't believe that Schluter (demon king of the pharmacists in the photo above) was ignorant of the Leedy vibraphone; if he didn't know it well he wasn't doing his job. The passage from Beck reads like a press release dictated by a copyright lawyer. And, ahem, the vibraphone chapter in Beck's encyclopaedia was contributed by Hal Trommer, who had been -- the sales manager at J C Deagan Inc.
Schluter definitely brought a half-developed concept to a (reasonably) perfect state. He replaced steel bars by aluminium, introduced harmonic tuning, and added a damper bar, thereby removing the obvious defects (or the exciting original features) of Winterhoff's creation. "Vibraphone" being a protected Leedy trademark, the Deagan instrument made its bow as the "vibraharp". Leedy in turn copied Schluter's improvements and brought out their own competing version. The Deagan instrument was the better seller, and was the model chosen by Red Norvo, Lionel Hampton, Milt Jackson, the artists who proved that the instrument actually belonged to a different world than that of the vaudeville stage that prompted its birth. In a minor victory for Leedy, however, only pedants preferred the name "vibraharp", and the instrument will be known as vibraphone until the end of time, except among those groovy people who call it "the vibes". So Schluter perfected what Winterhoff began; but Winterhoff was the begetter -- he developed, and brought to market, a new instrument with an immediately identifiable character of its own, a viable metallophone for modern music of all kinds; and he and his team developed the basic gadgetry (electric-motor-driven rotating vanes) that made it what it is. A Deagan Steel Marimbaphone is a most valuable addition to any orchestra in which it will replace the Italian Harp, having all the desirable tone qualities of the Harp with the additional advantage of always being in tune. Deagan Steel Marimbaphone blends perfectly with the voice and has a tendency to build it up and many of the more prominent singers carry a Deagan Steel Marimbaphone with them for accompaniment purposes. Deagan Steel Marimbaphones can be played by from one to four people, according to size and range and as two separate sets of selections can be played on an instrument, one with bows and one with mallets, the instrument is practically two instruments in one. Deagan Steel Marimbaphones are also very adaptable for home use, as the instrument is very simple to play and the tone is of absolutely the very finest quality, being similar to that of Musical Glasses, it makes and ideal instrument for a Music Room. Wow -- replaces the harp, invaluable for the singer, two instruments in one, absolutely the very finest tone quality and VERY SIMPLE TO PLAY. When PR gets this frantic you can assume that we are dealing with that dreariest of all things, the musical novelty. 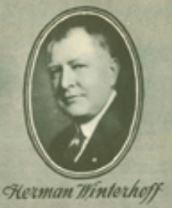 So as far as I am concerned, Herman Winterhoff invented the vibraphone. In part two of this post I will explain how he also invented the marimba.